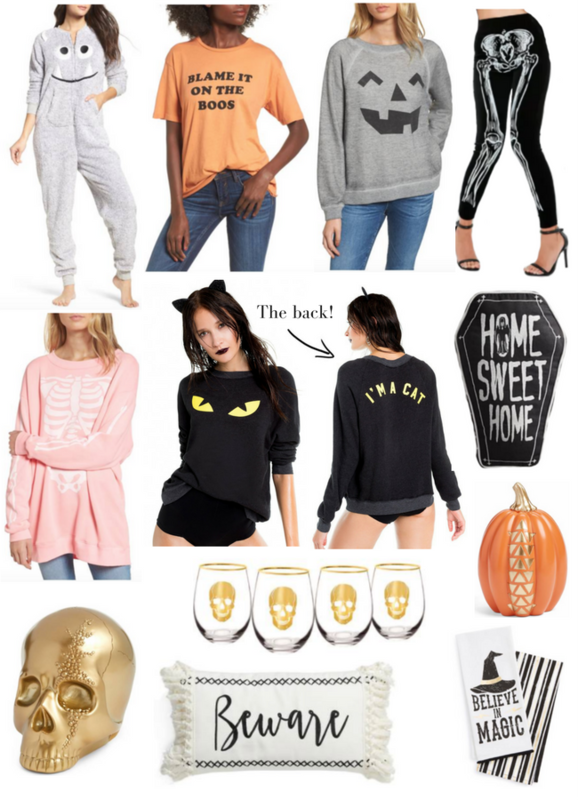 I might be the only one still on the search for cute Halloween themed things, but just in case I'm not, I wanted to share a few last minute finds with y'all! About half of these items are on sale because of how close the holiday is, but I just think that makes them better! Even if you don't get them in time for Halloween this year, you just stocked up in advance for next year. 😉 And to be honest, I would wear most of the clothes I picked out well into the rest of the fall season, I mean isn't that pink skeleton sweatshirt just too cute? Sorry today's post is so short, I've had a lot of things on my plate this weekend and have been trying to get everything set for traveling back to Orange for a week where I'll be celebrating Halloween with my roommates. What are you doing for Halloween? Would love to know if you already have your costume(s) picked out, I'm going as Kuzco from The Emperor's New Groove! The leggings! The pillow! The tea towel! The hubs and I shall be binging on Stranger Things 2 after the kiddo goes to bed. Ah! So excited for the second season!! The skull wine glasses are so cute and I need to get some for next year. Aren't they so pretty? I love that they aren't too over the top! These are fun and that monster onesie looks SO comfy!! I have been so busy that I haven't put out anything for Halloween yet but managed to order my kids costumers! You have inspired me that its not too late to get a few things out and celebrate! It's never too late!! You could put decorations out the day before and it would still be acceptable, haha! I need that monster onesie! haha It's so cute and looks cozy. I love onesies in the colder months. It looks perfect for staying in and watching movies, right? So cozy! I'm such a "last minute gal" when it comes to Halloween! Love these - especially the leggings, and the black cat sweatshirt! Oh same here! I'm just coming up with a costume today, way later than everyone else! Love the blame it on the boos tee haha. Don't worry - we legit just decided on our couples costume last night for a party this weekend. I still need to get a Halloween top! The "Blame it on the Boos" is my favorite! Halloween is my fave time of year, so these are seriously speaking to me. Super cute finds! I love Halloween. My favorite time of the year. I love that "I'm a cat" sweater! So cute and creative! Thanks for the post! I am so bummed that I didn't see the Blame it on the Boos shirt sooner! I spend way too much time on Nordstrom's website. Haha. SO MANY great picks, lady! I need those skeleton leggings in my life haha! I love the cat sweatshirt! It’s my favorite one! I think I'm binge watching 'Lore' and wearing a festive shirt haha. These are so cute! I love all of these! I just got festive socks and a t-shirt! These are all so stinkin' cute! I love teh wine glasses, so festive! Haha the 'Blame it on the Boos' shirt is so adorable! All of these are so cute! I actually don't have any Halloween decor. I've been debating about getting some but I tend to just decorate for fall. Ok, that jack-o-lantern sweatshirt is in a shop window here and I want to get it every time I walk by. Sigh...it’s so cute! And now I’m a little obsessed with the cat sweatshirt. It’s all so cute!